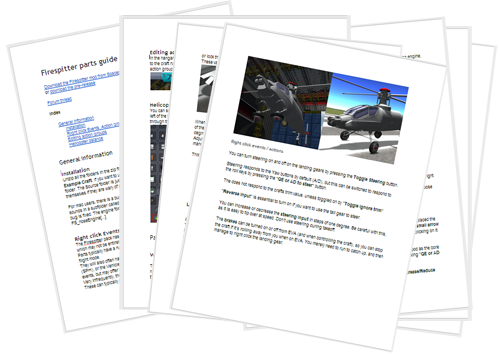 Firespitter adds a great number of plane and helicopter parts to KSP. These include engines, wings and cockpits with interactive IVAs, as well as other useful things like landing gear, seaplane floats, trim tools and other widgets. A number of other mods also use the firespitter.dll plugin. An explanation of the features of parts using these features can be found in the guide. Check out Scott Manleys video on installing mods. Make sure you put the Firespitter files in the GameData folder the way it is presented in the zip file. This mod relies on many assets that have to be in the right folder, like sounds and textures. If you get creative with the file and folder names, stuff will break! If you need just the plugin (for use with other outdated mods), check the the github repo. -Wheel alignment guides end the scourge of crooked gear placement. Press F2 to toggle guide lines. -FSengineSounds: Implemented disengage, running, flameout sounds, fixed bugs. -FSwing: Made leading edge action name cfg editable for use in extending flaps etc. wheres all the stock planes? Make An F-14 Tomcat Please. second i'm having problems with balance, sometimes ill make a completely firespitter craft and when flying it will suddenly tip, out of the blue and out of NO WHERE! if i download the latest one, which is 0.24.2, is it going to work in 0.25??? Please make an update for 1.0.5! There is one, search it up on KSP forums or Kerbal Stuff, https://kerbalstuff.com/mod/63/Firespitter. pls make update for 1.0.2 KSP!! Does it work for 1.0.2?? is it updated to KSP 1.02? we dont need to complain because its a really good mod so why do we have to?